Her quilts use a variety of techniques including English Paper Piecing, Hand Applique, hand dyed fabric and designing Mariner Stars. Her Millefiore Quilt Along uses striking combinations of 246 red, gray, and black hexagon blocks and was juried into the International Quilt Show in Chicago in 2016. Don’t miss seeing her beautiful quilts!!! July 2—16 For each $100.00 of your total purchase receive $20.00 off. Example: spend $255, receive $40.00 off, making your total purchase $215.00. Regular and sale priced merchandise. Let’s get funky with Minky. Join me as we learn great techniques on how to handle this oh so soft and comfy fabric. Feel free to add additional fabric to extend the size of your finished quilt. Finished size 48 inches x 60 inches. Big Sky Quilts is excited to be conducting I can Sew!!! Kids Camp for 5 days in July. Kids Camp is designed for the beginning sewer ages 10 to 14 to learn and practice the essentials of sewing. Classes will start on Monday with the basics of sewing including tools, hands-on activities on a sewing machine, common sewing terms and sewing safety. Class will finish up with practice sewing skills to make a simple fabric book mark. Each day will introduce more skills with plenty of practice through the completion of a project. Projects to be completed will be a fabric basket, roll-up organizer, simple lined tote bag and finishing up on Friday with a small zipper bag. Class size limited to 6 students. This is not just your ordinary wallet. Carry your cell phone, cash, cards, coins and still have room for your favorite lip balm and many other personal items. Finished size 8 inches x 4 inches x 1 inch. Time to pull out all the stops on this beauty. This bag will be a show stopper. Work with different types of interfacing, bag hardware and vinyl to create this beautiful bag. Big Sky quilts has conveniently prepackage hardware, just pick out your desired metal color. Bring a flash drive to class for the pattern. Join us for 3 days of outstanding long arm quilting training presented by certified Handi Quilter educator Kelley Ashton. 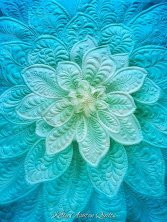 Kelly started the machine quilting trend of the Hoffman 'Dream Big' Flowers. Lecture and demonstration training will help you add precision and consistency in your quilting design, you will love using design rulers and templates. Meandering is the easiest and most common filler for background space, but there are limitless creative design elements to use instead. Come expand your design portfolio by learning the stitch path of a wide variety of creative filler designs.